I'm sure most of you guys must have been familiar to this kind of Facebook feature. Those of you who owns or operate a Facebook fan page, you must have known how to hide a post from the page's timeline. But now, Facebook has introduced another exciting feature that allows you to hide a post from your timeline. Which means, your status can only be visible /shown on News Feed only. I really like this feature though, and it's really useful if you don't want a status to be displayed on your timeline. 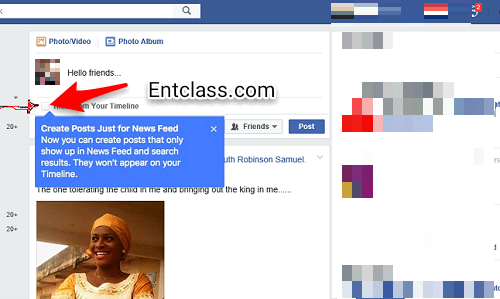 NOTE: This new feature is not included when sharing a post from your News Feed. When sharing, you still have the same options to share to your own Timeline, a friend's Timeline or in a group or event. I hope you grab? Alright, what do you have to say about this new feature from Facebook? When there is, we'll definitely post it.